In 1918 Majumdars were permanent residents of village Pakuria, District Pabna (now in Bangladesh). Amiyabhushan, however, was born in Cooch Behar, the capital of the princely state of that name, where his maternal grandfather was a lawyer of note. The day was 8th Chaitra 1324 (Bengali calendar), corresponding to 22 march of 1918. In 1927 he became a student of Jenkins School, Cooch Behar. Since then barring a few years this town was his permanent address. The road by which stands his home was renamed after him by the municipality a few years ago. He passed the Matriculation examination from the school named in 1934; from Victoria College in 1937 he passed Intermediate of Arts and in 1939 Bachelor of Arts with honours in English literature. Truth to say, this method of studying , the end of which was not related to good result in the examination had an earlier beginning. Anantabhushan, the writer’s father, ‘had this understanding of education; the whole of the subject, from the first page to the last page, should be appropriated to self; selection of important questions,” questions which were expected to be set for the examination, was not done’ This decided Amiyabhushan’s choice - distaste for inadequate skimming of the subject to learn also was instrumental in keeping him away from short-cuts to success in any test. To get a job became important even as he continued as a student in the college. In 1939 with Haque-League ministry ruling Bengal, to be employed was well-nigh impossible for Caste-Hindus. Ultimately in 1940 a job in the Postal Department was secured. 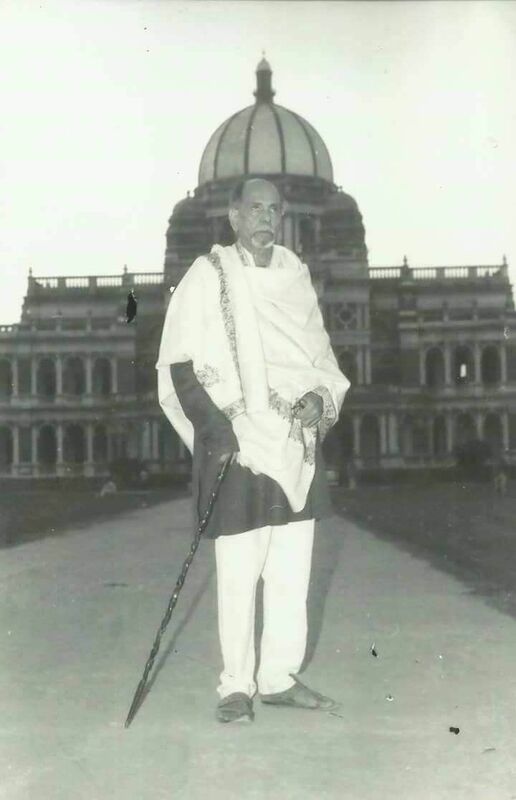 His achievements in his thirty-six years of service were manifold: organizing strike in pre-independence era, being noted by the police for campaigning against the idea of Pakistan, fluent speaking in Nepali, being arrested and losing job for some time for organizing strike in free India, being subjected to harassments and painful awareness of the possibility of losing life as a political party gobbled the trade union. On 14th December, 1940 Amiyabhushan married Gauri Devi (1924-85). She, a woman who knew how to give love as few did, fulfilled the genius’s life in many ways. To be a clerk in the post office, to be a trade- union activist, and to become a writer as few can even hope to be was possible because of ‘Gauri’s inspiration’. ‘The God on Mount Sinai’, a one-act play, serialized in two instalments in the magazine ‘Mandira’ in 1944 was his first published writing. ‘Promilar Biye’, and ‘Nandarani’ , two short stories published in the ‘Purbasha’ in 1946 and in Chaturanga in 1947 respectively, immediately caught the attention of a special strata of readers and critics for the very individual prose style. During 1953-54 ‘Garh Shrikhanda’ (in Purbasha) and ‘Nayantara (in Chaturanga), two major novels started serialization almost simultaneously. In fifty years thereafter, Amiyabhushan published 27 novels, 115 short stories, about 50 essays and 6 one-act plays. Perhaps the attention of the special strata of readers – we have just mentioned - had effects on Amiyabhushan being accepted as an author in two ways. Alokranjan Dasgupta, a scholar of international repute, a critic and a poet of very high order, asks Amiyabhushan (in a poem) to be a little more warm-hearted, and so choose Dasgupta as a reader. In other words, the novelist is not in need of popular acceptance, a highly gifted reader is seeking nearness, emotional and intellectual, with the novelist. Dasgupta as well as other writers and poets has been Majumdar’s admirer; and this may have been instrumental for Majumdar’s very limited popularity. There is a strong aura of ambiguity: his novels are prescribed texts for examinations in certain universities; the most popular history of Bengali literature doesn’t spend even one full paragraph on him. Again, he was awarded Bankim Puraskar (West Bengal government). Sahitya Akademy prize, D.Litt from two universities, and other honours. His complete works (in eleven volumes) have been published by Dey’s Publications , Kolkata. The contents, his other available books, and details of his prizes have been given elsewhere in this site. Any discussion about Amiyabhushan must include these two points. One, almost the whole of what he wrote were published in little magazines; because of the small reach of these magazines, many readers who were interested in what he wrote often failed to access his writing; Amiyabhushan was happy because he could ‘experiment’ as he liked, and no editor was in the position of telling him what to write. Two, many of these magazine were self-acclaimed Leftists, where does this connection place our novelist? That his “Avloner Sarai – Inn at Avlon – conveyed a protest against hanging of Imre Nagy is evident; as is evident his condemnation of Chinese annexation of Tibet in ‘Saiemia Cassia.’ And running the eye over his oeuvre, one watches the delineation of the backward people, of the landless labour of farms, the losing races like Rabha of Cochbehar-Asam and Sandars of Pabna, of those yet not included within the ring of advancement. To quote his words, “ Birendra (Chattopadhyay) could say that man was the highest truth and there could be nothing above him. When I said that there was nothing truer; nothing was above man: neither Ishwar-Allah or Marx-Lenin; then he seemed to be of two minds.” Nothing needs to be added to prove the point. Even when a boy, Amiyabhushan loved to draw and paint. At the age of eighteen his painting entered into a competition in Kurigram won the first prize. At about this time he painted “Kalodi” – portrait of his grand-mother (maternal); and this is extant. In 1978, maybe in 1977, the urge to paint became strong. As he himself explained, “I paint when I don’t feel like writing. Any idea of exhibiting these has never crossed my mind. The canvas catches paint as the brush moves, and I feel that the hundred-petal lotus in the brain is exuding nectar.” He did a number of portrait of his wife after her death. Yet from 1990 he hardly took up a brush. One can hope that the paintings which have survived will be evaluated someday. Death or as he himself put it, his ‘final, permanent present moment came on 8th July 2001 in Kolkata. (‘Bonechara’ by Enakshi Majumdar, the only full-length biography of the author has been recently published).